Created in 1961, ERA-SIB Company is celebrating its fifty years in 2011. Quality, innovation and service are more than words for us: they represent the commitment of our whole staff in the service of the users who have chosen ERA-SIB as a partner. Our skills in solenoid valves design, manufacturing and marketing for all kinds of applications (from the simplest to the most difficult) make ERA-SIB one of the world’s leaders in the field. Year 2011 marks a new start for ERA-SIB. This new website is an important stage in our development, but not the only one. The company has been reorganized and our activities have been concentrated on one single site, in Argenteuil, located in the beautiful department of Val-d'Oise, next to Paris, for more efficiency. Our dynamic team is more than ever at your disposal to meet all your needs. ERA-SIB offers the most demanding users one of the world’s widest and most complete ranges of direct acting or pressure assisted solenoid valves, in brass, plastics (polysulphone, PVC, PTFE, POM, etc. ), stainless steel, aluminum and bronze. ERA-SIB solenoid valves are available in all DC and AC voltages. All can be fitted with ATEX authorized explosion-proof coils. ERA-SIB offers also pneumatic, coaxial and motorized valves. Our range of products was supplemented in 2011 with many new models, in particular high-pressure valves in large diameters. The company will continue to innovate in the years to come. 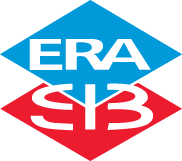 ERA-SIB is a French manufacturer and is present everywhere in France through a wide network of distributors and retailers, and can also serve you directly from its headquarters of Argenteuil. Thanks to its know-how, ERA-SIB has become the reference in completely different fields such as hot beverage vending machines, fuel dispensers, firefighting systems, spa bathes, cryogenics or railroad systems, as well as in all high pressure applications. Thanks to an active international development strategy, ERA-SIB is now making more than 50 % of its turnover in the export market all over the world, with the support of a continuously expanding dynamic distribution network. Regularly quoted in the press, ERA-SIB is an example of the dynamism of the French Middle Sized Companies which ally innovation and progress. ERA-SIB relies on many partnerships and networks to accelerate its international development (CCIV, Mechanical Comity of IDF, RMVO network, Committee of Economic Expansion of the Val d’Oise in particular). As ERA-SIB General Manager, I am proud to present you our new website. It will give you access to a very complete catalog of parts as well as to the details of our distribution network. I personally thank you all for your support and your confidence in our company.